Chip grew up in Roanoke, VA, where he spent lots of time following the weather, poring over maps, collecting rocks, and hiking the mountains. He earned a B.S. in Geophysics from Virginia Tech, an M.S. in Environmental Science from the University of Virginia and a Ph.D. in Geography from the University of Georgia. Chip became a professor at the University of North Carolina in 1993. 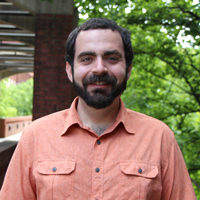 His research focuses on the synoptic climatological characteristics of extreme weather and their impacts across the southeastern United States. He has much expertise across a wide range of areas in climatology and meteorology, including heavy precipitation, tornadoes, hurricanes, cold air outbreaks, heat waves, and winter weather. He has published numerous research articles in peer-reviewed journals, including Monthly Weather Review, Weather and Forecasting, the International Journal of Climatology, Climate Research, and Applied Geography. And he was a co-author on the Southeast Technical Report for the National Climate Assessment. Chip has served as the Director of the Southeast Regional Climate Center since 2010. William spent most of his youth in California near San Francisco. He moved to Vermont in the early 1990's so that he could experience some real weather. In March Super Storm 1993 came plowing up the East Coast and planted the passion and ambition for Weather/Climate that would drive him along his career path. In 1998 he obtained his Associates Degree in Physics and transferred to Plymouth, NH where in 2001 he graduated with a Bachelors in Meteorology. His first Job was with Aquila Inc. a Kansas City, MO based energy company that was just spinning up a Weather Derivative Desk. While in Kansas City William was a Climate Data Analyst and managed a global database of weather data. He then went on to Work with a small group called GuaranteedWeather and finally with the Southeast Regional Climate Center in 2005. Within the SERCC William is the Service Climatologist and is responsible for climate research associated with the Southeastern U.S. and educating current and new users on how the SERCC can be of assistance to them. Sandra grew up on Long Island and after experiencing hurricane Bob during the summer of 1991, she knew she wanted to work in the field of weather/climate. She earned her Bachelor’s degree in meteorology from North Carolina State University and a Master’s degree in geosciences with an emphasis in broadcast meteorology from Mississippi State University. From the south she headed west and earned her PhD in atmospheric sciences from the University of Nevada at Reno where she focused on the impacts of air quality in the Lake Tahoe Basin. She has experienced many different weather events across the United States and is excited to share her experience and expertise with the Southeast Regional Climate Center. (Carolinas Integrated Sciences & Assessments). Jordan grew up in Shelby, North Carolina and graduated from UNC-Chapel Hill with a bachelor's degree in geography, specializing in earth and environmental systems, and a bachelor’s degree in political science. From a young age, he quickly developed a fascination with weather, especially with observing and tracking severe weather events and winter storms. Following this pattern, as a current doctoral student in the Geography department at UNC-Chapel Hill and a research assistant for the Carolinas Integrated Sciences and Assessments (CISA), his research is at the intersection of climate and public health. Specifically, he is focused exploring the utility of existing heat stress indices in modeling health outcomes and individual-level vulnerability to excessive heat. (Carolinas Integrated Sciences & Assessments). Rachel grew up in Swansboro, a small town on the Crystal Coast of North Carolina. She attended the University of North Carolina at Chapel Hill, earning a BA in Geography and a BA in Global Studies, with a focus on Global Health, as well as a minor in Medical Anthropology. Her research interests include health vulnerability to extreme climate events, health care capacity modeling, and crisis scenario and response modeling. She is excited to join the Carolinas Integrated Sciences and Assessments (CISA “See-Sah”) as part of their collaboration with SERCC as a graduate researcher. (Carolinas Integrated Sciences & Assessments). A native of western North Carolina, Montana grew up in the mountains of McDowell County in the small town of Old Fort. He attended the University of North Carolina at Asheville and Appalachian State University, earning a BA in History and a MA in Geography respectively. His interest in weather began in September 2004 when Hurricanes Frances and Ivan brought devastating flooding to the Blue Ridge Mountains. Since that time, Montana has been fascinated by extreme weather events ranging from drought to snowstorms. As a PhD student in Geography at UNC Chapel Hill, his research is aimed at investigating heavy precipitation events in the southeastern United States. Specifically, he is focused on understanding the impact of atmospheric rivers on flooding events in the region. John was born outside of Chicago and grew up outside of Raleigh. He graduated from NC State with a B.S. in Meteorology, and a minor in mathematics in May 2008. In January 2009, he was hired at the North Carolina State Climate Office for development of meteorological web products for both the State Climate Office and the Southeast Regional Climate Center. John's main project with the SERCC is the Climate Perspectives tool. John is also a part-time graduate student at NC State, pursuing his masters in Atmospheric Science. His graduate research focuses on the feasibility and construction of a high-resolution mesoscale reanalysis of North Carolina using the WRFDA model system. Peter Robinson has been involved in Applied Climatology since arriving in North Carolina in 1971. He was the State Climatologist from 1976 until 1980, at which time he left the state on assignment as Assistant Director of the National Climate Program in Washington DC. There he was responsible for Federal-State Climate relationships and was in charge of the climate data and information services. During this time he laid the administrative foundations for the program which evolved into the Regional Climate Centers. At the end of the assignment he returned to Geography Department at the University of North Carolina, teaching courses in atmospheric science and being involved in applied climatic research. He served for a period as the Chair of the Regional Climate Centers National Oversight Committee. He is a Certified Consulting Meteorologist, slated to serve in 2008 as the Chair of the Administrative Board for the program. He is also the US Representative to the International Geographical Union Commission for Water Sustainability. He became Director of the Southeast Regional Climate Center when it was relocated to the University of North Carolina in April 2007 and in the Spring of 2010 he retired to the UK.